I am thrilled to announce the joyful, peaceful birth of my first baby, Claire, on Feb. 10! I did the Hypnobabies Home-study course and loved it. I was very afraid of the birthing process when I started, but within just a few short weeks, I was excitedly looking forward to it. I knew it could be a positive, beautiful, joyful experience thanks to the daily affirmations and positive philosophy and testimonials of Hypnobabies. It gave me confidence to make a birth plan that I wanted and the confidence also to know that I could positively accept any path that my baby’s birthing took. It helped me stay lovingly patient waiting for the birthday my baby chose. On my baby’s guess date, after lots of walking and the Baby Come Out track the day before, I woke up to what I suspected was a small amount of amniotic fluid leaking. We called our midwife, who told us to come into the office. Sure enough, my water had started to break. I was having regular pressure waves but they just felt like Braxton Hicks. I was Group B Strep positive, had some meconium in my fluids, and was not dilated at all, so with all those factors, we decided with our midwife that we needed to induce. Induction had been my biggest fear all along because I was afraid I would not be able to handle Pitocin pressure waves. 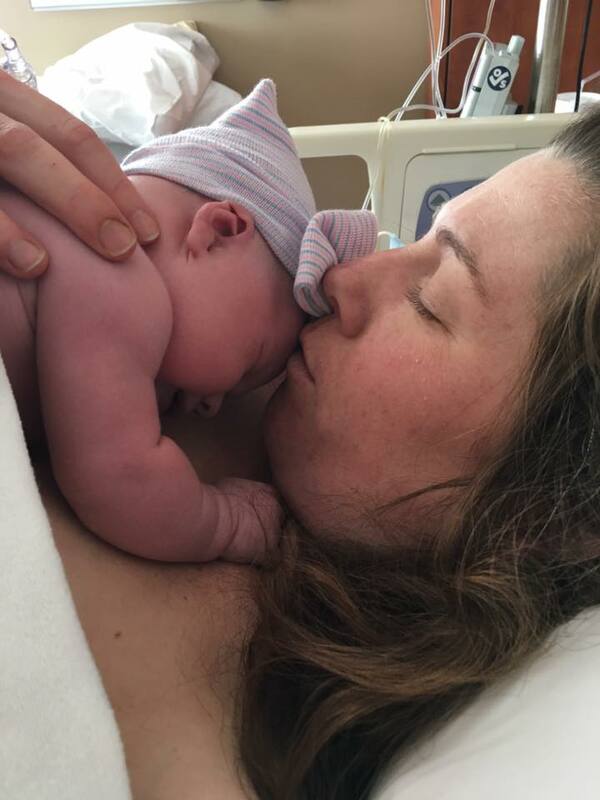 Nevertheless, with this combo of water broken, not in active birthing time, and Group B Strep, plus meconium in the amniotic fluid and no dilation yet, I wanted to follow my midwife’s advice to minimize the chances of various infections. I was happy that it was my baby’s birthday, and I remembered to accept any path that my birthing time brought and that every birth is a unique and new birth. My husband and I went home, got our bags, and went calmly and happily to the hospital. We were excited to be there. As we got off the elevator at the birthing floor smiling, my water broke fully. I was surprised that it continued to gush in huge quantities for 15 hours. I did not expect that. To avoid Pitocin, and with birthing waves still not kicking in and no dilation, my midwife inserted a Foley bulb, which is a long plastic tube that goes into the cervix and inflates a firm silicone-type bulb to 3cm. The tube hangs out and they tape it to your leg. I told everyone to hang on while I put my headphones in and listened to my Deepening Hypnosis track (which was what I listened to the most throughout my pregnancy) while they put it in. I got in the zone (hypnosis), and they were impressed with how I took it. I used my Deepening track and Easy First Stage/Birthing Time Begins tracks for hours. The pressure waves immediately intensified as soon as the bulb was inserted, and there was a lot of pressure from the bulb between my uterus and cervix. The bulb was supposed to take 2-3 hours to fall out, which indicates dilation to at least 3cm. Mine took 10 hours with increasingly intense pressure. I kept the room dark, and moving around and standing helped a lot. After it came out, the pressure waves increased immensely. 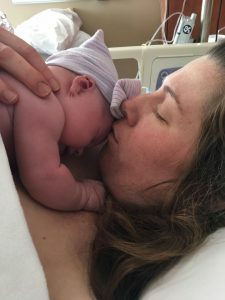 (Trigger warning … Bubble of Peace … everyone’s birthing time is unique, and mine ended up being very positive and joyful but required some intervention…) There was someone down the hall having a very audibly traumatizing birth, and it really threw me off. At hour 15, I got in the tub, still with my audio tracks, but I had lost too much focus, the pressure waves were coming so hard about 1 minute apart, and I knew I still had hours to go because I was only dilated to 3-4cm. I started shaking uncontrollably, like when someone is in shock, and I could not relax. My body was exhausted. I called in the epidural, and within 20 minutes felt relief. Everyone was so supportive in honoring my decisions and acting quickly. In the 20th hour of my birthing time, I was able to take a 2-hr nap, which felt amazing, and when I woke up, I was dilated to a 10. It was a beautiful sunny winter day, and it was just me, my husband, our midwife, and one nurse in the room. We were all smiling, and I innately knew from Hypnobabies that my birthing time would be positive and joyful, and it was! I pushed for 2 hours and she crowned for 45 mins, but I was not uncomfortable or panicked at all. My midwife provided excellent perineum support and helped me stretch gently. The team was wonderful, and everything was so calm. After the head finally came out, they told me to stop pushing, and feeling the entire rest of her body come sliding out was the most surreal thing of my life. My 8lb 7oz, 21.5″, beautiful baby girl came into the world and was placed immediately onto my chest. I could not believe how soft she was! I was completely alert, coherent, focused, joyful, and calm. All things I learned from Hypnobabies. (I was surprised I didn’t cry at the time, but writing this for the first time, I had to stop and take a tearful, joyful cry!) My birthing time took many twists and turns that I did not plan for or expect, but I truly felt at peace the entire time (even when I started to lose it before the epidural, as through it all I still knew I was in charge), and confident in both my plan and the changes. I will always have Hypnobabies to thank for my amazingly peaceful pregnancy and incredibly positive birthing and healing time!